BoardGaming.com> Games> Board Games> Risk 2210 A.D.
As the leader of a warring faction, you control the destiny of your people. On the Earth, in the great underwater domed cities beneath the oceans, in orbit, and even on the Moon, you must marshal your forces, send forth your troops, and hire the right commanders to crush your enemies. Build alliances if you dare, but be wary of whom you trust. Energy is the currency of the 23rd century; spend wisely and you just might conquer the world – and beyond. RISK 2210 A.D. also includes everything needed to play the classic game of Risk. First, a word about the “Risk” I played 25 years ago as a teenager. The board was static, with familiar choke points, and the flow of the game was very predictable and boring and only suitable for games of 3 or more. Now, fast forward 25 years. The Kid tells me he wants to play Risk and I’m dreading it. (a) I do not have a single pleasant memory of that game (“Take Australia” being the principal memory) and (b) we normally have only two players. But I’ve heard of this version, bearing the names of Designers Rob Daviau and Craig Van Ness, the two hobby giants who also brought us Heroscape. And it says you can play with two, and we had B&N store credit to burn, so Risk 2210 joined our collection. 1. The map is very similar. Land bridges connect Africa and South America and Alaska and eastern Asia, just like in the original. There are, however, also territories in the water, for instance, a chain of them connecting southern Africa, India, and Australia. You don’t colonize the water territories at game start, but they provide terribly important flexibility to break up the rigid structure of the familiar Risk map. Another terrific change is that, at the beginning of every game, four land territories are randomly selected from the deck and marked as “destroyed lands,” off limits. The game changes dramatically just based on which are those four. 2. Plus there’s the moon. You can go to the moon, attacking it relatively easily once you have the resources at your disposal, but it’s very difficult to defend. Very fun, and wild. 3. Your army is composed of robot-looking things and some commanders. You start with the Land and Diplomatic commanders; Nuclear, Space, and Naval commanders can be purchased with energy tokens. The energy tokens, which you get as income just like your armies, can also purchase cards. There are cards associated with each commander and you can only buy those commander’s cards if you have that commander in play. Most of the commanders give you some combat bonus, too. 4. There is a solid 2 player variant. You set up the map as I described and basically install a third power randomly, taking some water, land, and lunar territories from the draw deck for it. The third power sits in those territories, 3 armies in each, and the 2 players battle around and through it. I can’t recommend this game highly enough for those looking for a Risk playable for 2. I would have loved Risk Legacy, which makes me drool, but that’s for 3+. The one thing that bugs me is the cards can be *very* swingy. Your master stroke will be completely undone if your opponent is holding the one right card. 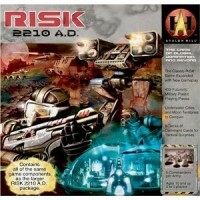 Risk 2210 A.D. is a neat sci-fi/post-apocalyptic twist to a classic game where mech robots battle it out for territory. Gone are the days of playing Risk for hours and hours on end with one, two, or three people eliminated waiting for the game to finish. The game is set to only go 5 rounds (years), and whoever has the most points wins the game. This game contains a lot of neat mechanics to make the gameplay interesting with very nifty strategic choices beyond the basics of Risk mastery. The game begins with each player setting up their set number of units by picking territories to place their units in just like normal Risk. However, four of the territories are randomly removed from the game by placing “Devastated Land” markers on them that no player can enter. This provides a neat replay factor where the map will not be the same every time you play and changes each players overall strategy. Also, there are now “moon” and “sea” territories, but those aren’t allowed to be used at the start of the game. The last setup turn is different in that the players place their “commanders” and “space station.” What? Commanders? Space Station? Yep! Another new twist is the concept of commanders and space stations. There are 5 types of commanders: Space, Land, Marine, Nuclear, and Diplomat. Each player starts out with a Land and Diplomat Commander, the rest have to be “hired” or paid for by 3 energy (game currency). Each commander has different characteristics that provide bonuses when attacking and defending the units they are alongside, and give players access to tactical cards you can buy based on the commander type as well. The Land commander gives a player extra attack and defense bonuses (8-sided die instead of 6-sided die) for units on land and has cards that help units on land. The Diplomat commander only gives a bonus on defense and has more counter-defensive/disruptive and extra point cards. The Space commander provides access to the moon with bonus die for attacking and defending on the moon, and the cards help moon units. The Marine commander provides access to sea territories with attack and defense bonuses at sea and cards that help sea units. The Nuclear commander provides bonuses on both offense and defense for any units location and has the most riskiest and costliest to activate cards(most damaging even to yourself). The space station provides a defense bonus and allows an entry point for units to move to the moon territories from land, once a space commander has been acquired. Now, a normal round for each player begins with an auction for turn order. Each player bids “energy” (start with 3) to determine who gets to pick their turn order and sometimes it is more important to not pick the first turn. After play order is determined, the player begins their turn by reinforcing their troops and collecting energy based on the number of territories they own and the number of entire continents, sea colonies, or moon colonies they completely possess. They then have an opportunity to buy another commander or space station, and then buy up to 3 cards. That is of course if they have enough energy which is also used to activate certain cards. So careful energy management is another strategic option that must be managed in this game. Once these steps are completed, the player may begin attacking just like normal Risk and continue to attack until they are done. Battle is resolved as normal risk, and once a player is finished, they can reinforce one territory by moving available units across connected territories the player occupies. This done for each player, and the round is complete when everyone gets a turn. Then the auction begins again for the next round or year. Once five rounds are done, all the players tally up their points based on territories owned, complete continents owned, complete colonies owned, and any point cards played; and the victor has the most points as always. Overall, this is by far the best edition of Risk I have yet played. It brings a lot more strategic depth to the plain vanilla Risk game. There is so much going on besides just acquiring more territory to acquire more troops which is still important. Energy management is critical in being able to pick your turn order, purchasing commanders, purchasing cards, and activating cards. Hand management is critical as well for supporting your commanders and playing the appropriate card at the right time to help your overall strategy. The “Devastated Lands” can also dictate what may be the most optimal strategy based on which lands are blocked at the start of the game and add a lot of replay value. Each commander provides strategic options to help you accomplish victory not just because of the cards, but the territories you can now occupy. Of course the best part of all is the game is limited to five rounds instead of taking forever between skilled players! I say that it won’t take forever, but the added options do make players prone to “analysis-paralysis” drag the game out sometimes. Also, it’s very rare that a competent player is eliminated from a game (unless other players gang up on you), because it is limited to five rounds. Because of the depth of options, this version of Risk should appeal more to power gamers, and the limited play may help casual gamers even with the long setup time. For those squeamish about wargames and kids, the units are mostly robots, so you can be less squeamish about tearing up their opponent. This helps you introduce a wargame to your kids more easily, and my son just loves the robots! So it has appeal to family gamers as your kids get older. It’s just a great game altogether and worthy addition to your collection! The premise is war in the year 2210. Many of your favorite countries have changed boarders, or have new names. Some territories are so ravaged by nuclear war, that they are no longer playable. To replace these destroyed land sites, the moon and the seas have also been added. Your armies consist of your standard 1, 3, and 5-point troop, but now with the added advantage of 5 generals and bases. The game plays with most of the same strategy as the other Risk games, attack and defend territories, the more you control the more troops you get. The Combat system remains the same, except for when you use the new generals and base. Each of your commanders, Land, Space, Naval, Diplomat and Nuke can buy and use their categories strategy card. They cost energy( A new aspect to the game) to buy, and some cost energy to use. Many of the Land cards resemble the effects of cashing in cards in the original game. But many cards allow for dramatic effects. Why does this game with all its neat additions really beat the original? The limitless game possibilities. With the original, if a group played about a dozen times, it would get old, the games looking similar as peoples strategies become predictable. With this game, The board itself is different every game. And the addition of lunar and naval options make it almost impossible to stick to any one sure way of winning. One more big plus is that the game only last five turns. Unlike the original which could take dozens of turns before one side gained the lead, this one you must make all your plans based on the war ending in 5 years. Warning: Don’t try and play more turns than this, the Earth’s resources literally dry up and the game will lose its strategic value. Think ahead, and make your grand moves on the last turn and victory can be yours! We’ve all played the original RISK, and for many it has come to represent “Ameritrash” games at their finest—long, tedious, and whittling down the player count over the hours. Yet it presents an interesting balanace of random dice rolls with real strategy. This update, the best of many in my opinion, adds what is missing for the serious bard gamer. Special cards to play, with varying play costs? Check. More ways for losing players to come back into contention? Check. Components: The little “Battletech” style pieces look cool, and the board is beautiful. Play: By limiting the number of turns, the designers encourage rapid expansion and risk (no pun intended) taking to slower, crawl-out-from-Australia strategies. The addition of moon territories, sea areas, and new passages freshen up a familiar board. Bidding for turn order adds new strategy, especially when you attempt to “double up” turns. Commanders allow special privileges in addition to combat bonuses—no travelling to the moon without a moon commander, taking sea areas without a sea commander, etc. Cards, some powerful, can swing the balance of play but not enough to unbalance things. Bottom line: If you loathe RISK, 2210 AD won’t sway you to the dark side. But if you liked the original but feel you’ve grown beyond it, definitely try this. Sometimes a direct combat game with obvious progress indicators beats the more abstract Eurogame feel for a change of pace. One of my favorite variants, short of Legacy but that’s kind of it’s own animal. Various commanders with their cards was a really nice addition. Useage of energy was not only effective but thematic. A really good version for weaker strategy players as the commanders could give them a needed edge and level the field a bit. Nice work with the generals and command cards. Easy enough to play/learn as the basic mechanics are intact. Five commanders were nice but might have been too much??? That being said, I could go either way on that one really. Overall, a great variant a classic! This was the very first “serious” boardgame I ever bought and played, some ten years ago. Since then I’ve played much more complex games, true, but this has always had a fond spot in my heart. When you’re feeling like you just want to take over the world with MASS armies, rolling dice, with just enough tweaks through cards and just a few special units (i.e. still on the light side of gaming) then look no further! The only downside to this game for me is the 5 turn limitation. Granted, each round takes about 1 hour complete, but it always felt so ‘abrupt’ to “just finish” the game after a fixed amount of turns. A mission system, for example, or some sort of “end game trigger” would have made it better. I love this version of risk, adding in charecters, the moon and under water territories was great. Having Cards effect the game and bidding for first turn is always great. This is a game I wish I could have more time to play. Add a Review for "Risk 2210 A.D."